Home ADMISSIONS Counseling NOTIFICATIONS TG State TS Admissions TS LAWCET TS Notifications How to give TS LAWCET Web Options 2019 on http://lawcetadm.tsche.ac.in/? 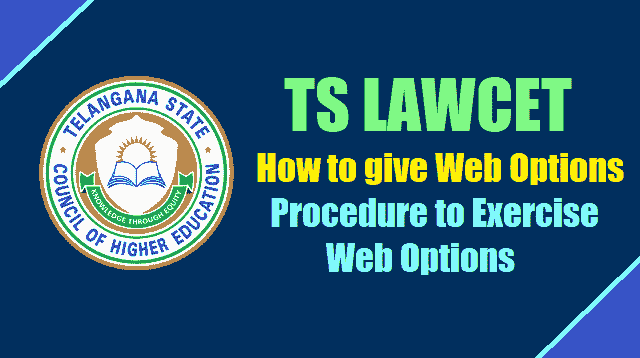 How to give TS LAWCET Web Options 2019 on http://lawcetadm.tsche.ac.in/? How to give TS LAWCET Web Options on http://lawcetadm.tsche.ac.in/. TS LAWCET-2019 Admissions Procedure to Exercise Web Options: The qualified and eligible candidates of TS LAWCET/TS PGLCET 2019 Examinations should attend the certificate verification for Web counselling for admission into LL.B (3-years courses) and BBA LL.B / BA LL.B / B.Com LL.B (5-years integrated courses) & LL.M courses for the academic year 2019-2020 as per the schedule at the following Help Line centres. Candidate has to get the certificates verified at Help Line Centre before he/she can start exercising options. PIN number would be sent to registered mobile number. Exercise web options as per the schedule. Allotment will be made in the order of preference of options and exercise utmost care while entering options. Candidate can download the provisional allotment order and report to the concerned college. Step 1: Open the website http://lawcetadm.tsche.ac.in/ . The TS LAWCET Homepage is displayed. Step 3: Enter your TSLAWCET-2019 Hall Ticket Number, Date of Birth and Rank and click “LOGIN” button to proceed. Select any one of the options either “registered mobile” (or) “registered emailid” to receive “5 digit PIN number”. Click on “send PIN” button to receive the PIN. Do not share this PIN number with others. Step 6: After successfully login, verify the information submitted at the time of registration for “TSLAWCET-2019” . - A window will appear displaying College details / Information for selection. Scroll Up/Down to view college list. - Click on the check box to “SELECT” / “UNSELECT” the college. - Click “view checked” to view all the selected list of options. Click “uncheck” to clear list / clear all selected options. - Use “search” field to access a particular college /Course/ College Type/ Fee Type/ District. Step 9: Click “SAVE & CONTINUE” to proceed for the submission of priority list. - Candidates can view the Final List of Colleges before Final Submission. - Candidates can click “Back” Button to Edit / Remove / Add Colleges in the Final Priority List. - Click “Final Submit” to submit the final options list. A copy of the options list is mailed to the candidates registered maid ID. - Once “Final Submit” is clicked the candidate can’t make any kind of changes or edit the list of options.